If you don't see your model number, don't give up! Not all model numbers are in our database. Please view all parts currently available for BAKERS & CHEFS, listed below by part type. Still no luck? Contact us - we're here to help! 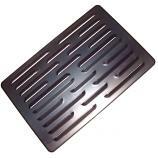 Find Replacement Parts for BAKER'S AND CHEF'S Gas Grills. Where do you find a model number on a Bakers & Chefs Grill? First, try looking on your original owner's manual. Usually the model number will be listed on the bottom of each page. If you don't have your manual, that's fine too! Sam's Club professional grills have small metal plates or labels with certification information on them, including your model number. These labels are usually on the back of each grill. Look for a number that starts with Y, 9, or M. Some Bakers & Chefs models also start with GQ. Most Bakers & Chefs gas grills have been made for Sam's Club by a manufacturer called Grand Hall. If you find the number '608SB,' this is actually the part number for your side burner. Still no luck finding your Bakers & Chefs model number? Call us! We want to help you keep your grill in your backyard and out of a landfill. We can use measurements of your original Bakers & Chefs burners, cooking grids, heat shields and other parts to find replacements for your grill. Just remember to remove the parts from your grill before measuring them to ensure you get the most accurate dimensions. Sams / Kirkland Cooking Grid Set, Stainless Steel | 19-1/8" x 32-3/8"